I’m a snacker. I don’t really do meals. I pick. But that means I sometimes get hungry at random times and being a vegan, it’s not always quite so easy to grab something quick to eat just anywhere. 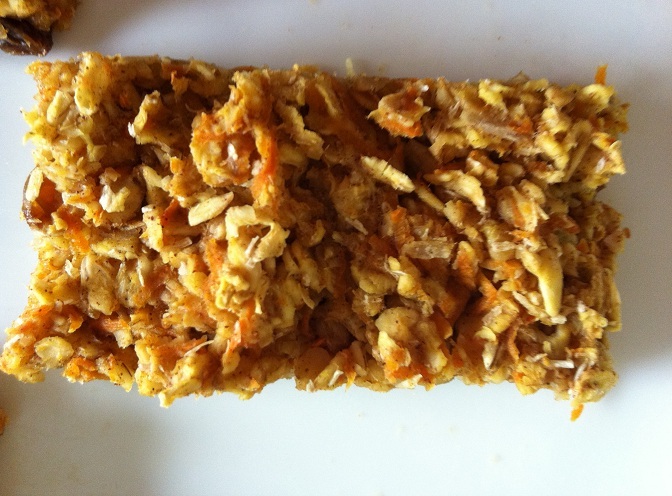 That’s why I surround myself with snack foods – and LaraBars are my usual go-to. LaraBars have gotten me through Italy and Ireland. They’ve gotten me through hectic days at work when there’s been no time to run out and grab lunch. And, LaraBars have gotten me through weekends when I’ve been heading out to meet friends but just need a little something until we get where we’re going for dinner. I keep them in my desk drawer, my handbag, my work bag and even my glove compartment – and, yes, I have proof that all except the Joco ones do survive the Florida heat… a little soft, but they survive. What I love about LaraBars is that they generally have only about 4-6 ingredients and I’m pretty sure that never includes honey or agave – the two sweeteners that make me nervous. Instead, they generally have a base of dates, one or two nuts for fat and fiber, and the flavoring like ginger or cocoa or apple. And, they’re filling. If I had to find a downside, it’s that sometimes they can be too filling. They’re so tasty that I can’t always put them down after a bite or two and end up finishing the whole bar, which means I then get so full I’m not hungry for dinner. But, I digress. Back to the topic at hand. Lara has long been in a category all of her own. Even some of the other brands that I love like Vega and Garden of Life all still have agave, which is great for most people, just not for me. And not that I don’t love my LaraBars, but I’m still always on a quest for new easy to eat foods that have minimal ingredients and none of the ‘stuff’ my body doesn’t like. Then, at Rollin’ Oats the other day, I stumbled upon something I’d never seen before! 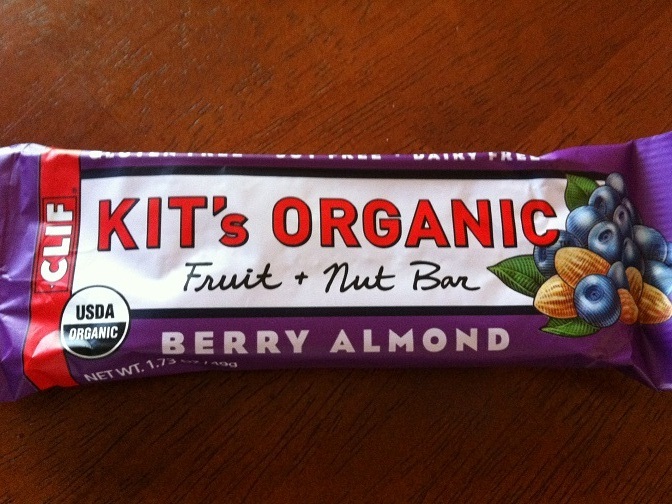 Kit’s Organic Fruit and Nut bar by Clif Bar! So, as I’m prone to do, I picked it up to check the ingredients, fully expecting it to have agave, and wouldn’t you know, it had none of that. The Berry Almond version had: Organic Dates, Organic Almonds, Organic Barberries, Organic Bilberries, Sea Salt. That was it! Cashew: Organic Dates, Organic Cashews, Organic Almonds, Sea Salt. Chocolate Almond Coconut: Organic Dates, Organic Almonds, Organic Unsweetened Chocolate, Organic Coconut, Organic Virgin Coconut Oil, Sea Salt. Peanut Butter: Organic Dates, Organic Peanuts, Organic Almonds, Sea Salt. Obviously they’re Gluten-Free, Soy-Free and Dairy-Free. Like I said, I went for the berry for my first try. It’s heavy on the berry, light on the date, which means it doesn’t sit in your stomach like some bars can do. It has a nice tartness to it from the barberries and bilberries. I love that they went with these unique berries and not the typical cherry, strawberry or raspberry. Barberries have anti-inflammatory properties and are known to help digestion and aid in stomach aches. Bilberries actually stop diarrhea and are known to be good for your eyes, even being proven to improve vision and other eye disorders. I will definitely be adding these to my bar collection and will be giving the other flavors a try too! Tonight I have the joyous experience of doing an online traffic school course… a four-hour traffic course! Which, I suppose, if I were to look for a silver lining, at least it’s not the 8 hour court ordered one! But, it’s a full four hours and you can’t make it go any faster than that thanks to their super duper enhanced timer that the instructions are quick to point out knows if you even go to a different website and forbids the user from doing so. Lucky for me, I have two computers so while one does the great countdown watching four hours of my life slowly tick by, the other has Pandora jamming and is my chance to write. So, take that, boring driving course! Ha!! Ok, so maybe I’m a little hostile. Maybe it was my fault that I was speeding. But, come on, I was late for an acupuncture appointment, and, of course, it was because of a car accident along the way that had traffic stopped. Ironic, I know. And, no, the other irony of the situation, that I was stressed and speeding to get to this supposedly relaxed and calming experience is not lost on me either – which, of course, makes it all that much more frustrating! So, what does all this annoyance of a way to spend a Monday night have to do with my delicious discovery? Well, if you’ve never had the pleasure of doing one of these online traffic courses, let me explain how they work. After ignoring the bombardment of fliers from everything from “the cheapest traffic course” to “the funniest traffic course” to “the most intellectually stimulating traffic course” (which, btw, is a joke. Such thing does not really exist), most people, like me, are probably more likely to just google Florida Online Traffic School and take one of the first ones that comes up. There are a few pages of instructions and making sure you can figure out how to click the answers to the questions properly, and providing the software with basic information that you and only you would know in order to avoid fraudulent activity and, I imagine, people getting paid to read about crazy drivers for four hours, the timer begins. Each section has a set amount of time. You can take longer, but you absolutely can’t do it in less time. Which means, if a section is supposed to take 40 minutes, and it only takes you 15, you then sit and watch the seconds tick down for 25 minutes. Translation, you have an awful lot of time where you probably don’t want to wander too far away so as to finish it as soon as possible. For me, that means hanging close to the kitchen, and feeling a bit antsy. Now, I suppose I actually could be using this time wisely, but there’s something about knowing you’re a prisoner to the clock that has me a little jumpy. It’s somewhat reminiscent of my days in Boston when we were walloped with snow and it wasn’t that I needed to go anywhere, but just knowing I couldn’t go anywhere made me feel trapped. At first, to pass the time and settle myself down a little, I tried to just eat some chips while I was reading and answering the questions. Then decided that wan’t cutting it and I need to saute up some tempeh and leftover steamed broccoli, thinking a good meal would calm me down. Took advantage of my ‘break’, threw that on stove, and gobbled it up. It was good, but didn’t exactly hit the spot…. and there was still a lot of time to go on the clock. Looked around the kitchen and the bananas on the counter called out to me. Thinking that would be the answer to finally getting down to business. After a few bites, I decided that was slightly on the boring side. 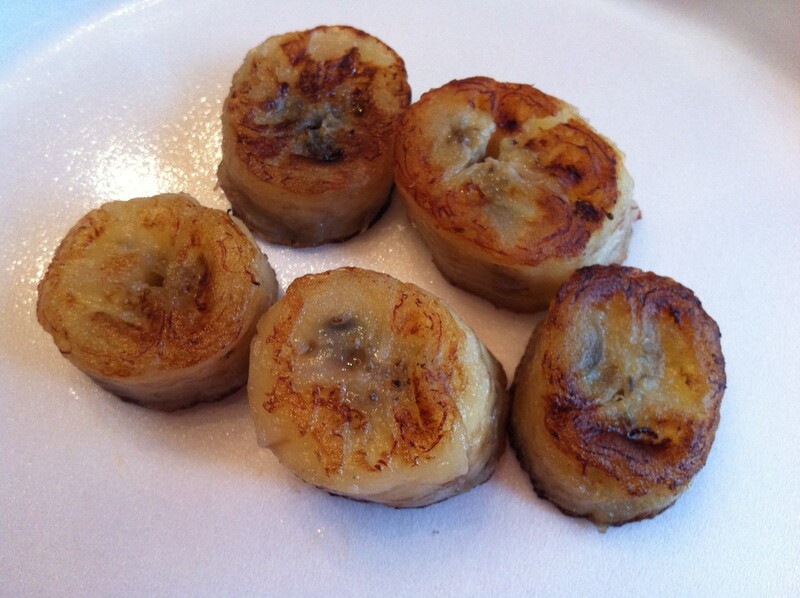 Since I’m on a mission to get more coconut oil in my diet, I decided to ‘fry’ up some bananas in the coconut oil. I figured it was going to be good. I just didn’t know how good. And, in case it wasn’t abundantly clear, my brain is a bit in overdrive right now which meant no time for creativity… the oil and the bananas would have to do. Amazingly I found the patience to let them cool on a paper towel – slightly – and popped one in my mouth. Yum! Warm. Mushy. Tropical-y. And, oh-so-satifying! A marriage made in impatience heaven. And, miracle of miracle, sweet cravings and anxiousness sufficiently satisfied. One ended up a little crunchy and that was a surprisingly delightful treat. Next time, when I’ve actually taken a deep breath and not gone through the kitchen like a tornado, I might even kick it up a notch with cinnamon or nutmeg. I imagine, whatever your style, there are so many options — iced cream, brown sugar, a little almond or peanut butter, dare I say — cocoa, shredded coconut?? I should probably stop while I’m ahead. And, besides, the timer is approaching zero. Woo-hoo! Only 2 1/2 more hours to go … and thanks to my bananas, I am good to go! 8. Top as desired. Serve and Enjoy! Ever have one of those days where you just feel out of sorts and like you know what you want but you’re not really sure how to get there … and on top of it, feel like nobody around you ‘gets it’ – or at least gets you? Well, I was having one of those days… or, make that one of those years. Without going into too much of a pity party, let’s just say my world of confusion started after a particularly difficult breakup. For a few months, I’ve just been out of sorts. That’s when my father brought up my ‘ex’. Normally this topic would set me into a tailspin, but I decided to hear my father out and listen to what he had to say – and, I’m glad I did. My dad pointed out what it was about ‘him’ that I loved so much. He was different. With him everything was an adventure and no dream of mine was silly. He was the one who encouraged me to go through yoga teacher training and he always believed in my dream to own a tea shop. He let me show off my new yoga postures, even when I landed on my head, and humored me when I listened to Kirtan music. And, he didn’t judge – me or anyone else. It was ok to be me, even if that version of me was seen as flaky by many people. Now, compare that to most of people I deal with on a daily basis (BFFs excluded – because they rock!). Most people I encounter are good with status quo. They do their job, and, don’t get me wrong, many do it well, but they’re happy with where they are… going to work, going to the gym, going out to dinner, going to movies … all with their significant other and their friends and they’re not looking to rock the apple cart. Not that there’s anything wrong with that, but it’s just not who I am. I want to turn the apple cart upside down and see what’s underneath it! I can’t help but think this is how most yogis feel. We question. We ponder. We look to understand ourselves and the world around us. After all, we engage in a practice that comes, for all intents and purposes, from another country and another culture. We look for deep meanings while at the same time looking to simplify. We look internally and we open ourselves to possibility. Not to mention we’d much rather wear spandex pants all day…. It’s who we are. And, we don’t always fit in to the rest of normal society because of it. Now, back to the conversation with my dad and the lesson I want to share. As I was sitting overlooking an amazing view in downtown St. Petersburg, in the lush gardens outside the magnificent Dali Museum, watching the sailboats float by on a beautiful Saturday afternoon, taking it all in and trying to stop my restless mind, all I could think was that things just didn’t feel ‘right’. Seriously! Here I was in a place surrounded by people who’d traveled from around the world to experience this place, and all I could think was that it didn’t feel right. And in that place of not feeling right, I was putting myself down. You are just as good, just as smart, just as capable, if not more so than everyone else in the neighborhood. You just need to find a new neighborhood. That’ when it hit me that that’s what so many yogis do. All of you who have travelled to India or other places around the globe to immerse yourself in other cultures that have allowed you to grow and learn, you are finding a new neighborhood, one with people like you.I think this is why I love yoga so much. The yoga community is like a mini-neighborhood, filled with people who are looking for more, questioning more, and aren’t afraid to do what it takes to find those answers. Each studio is almost a microcosm of the bigger yoga community. I’ve heard yoga teachers talk about their experiences with yoga and how it just feels right. The mat, the studio, the other yogis, the asanas, the pranayama, together they make a home in a unique and special neighborhood. In my efforts to do something about my nutrient shortage and figure out a way to keep from feeling like I’m running on fumes and in need of a constant caffeine kick, I’m seeing a trend in everything I read… dark, leafy greens, dark, leafy greens and more dark, leafy greens. I love spinach but there’s always something a little weird to me about the texture of it. It always feels a little gritty. It’s one thing to have gritty-feeling food when you’re on a picnic at the beach, but it’s an entirely different experience to be eating your veggies knowing that you’ve cleaned your food and it still feels funky. 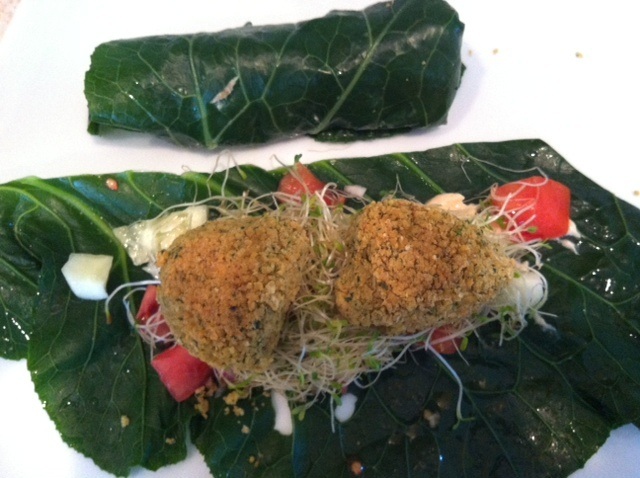 Then, the other night, we had stuffed collard greens, and they were really good. They were simply boiled, pretty tasty and not too bitter. Then I started finding even more recipes that I want to try with collards, still knowing they were nutritious but not really realizing they were the equivalent of the nutrient jackpot. They help lower cholestrol. The reasoning is a little complex but essentially it gets rid of bile acids so that the liver has to use up the cholesterol that’s hanging around in order to produce more bile acid to help us digest food. 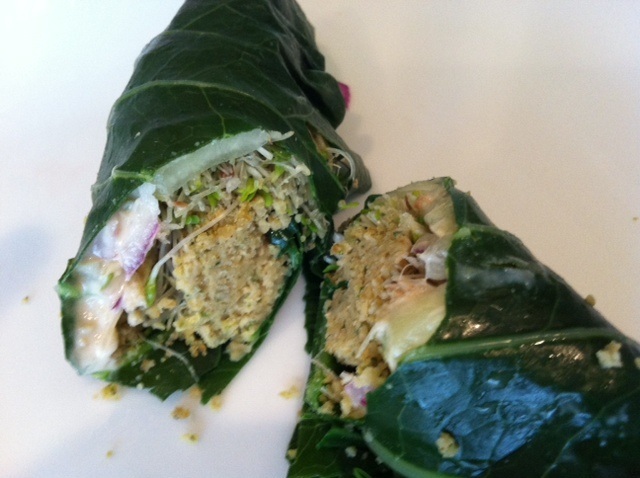 5 grams of fiber per cup – which doesn’t sound like whole lot but that’s 85 percent of the RDA and only 200 calories. Compare that to, say, almonds where a 1 oz. serving (about 25 nuts) has 3 grams of fiber and 15 grams of fat. Not to knock almonds. They’re a regular feature in my diet, but that’s a whole lot of fat for the same amount of fiber. It’s also high on the Vitamin c, Folate, and iron scales. I discovered some really good ideas on Pinterest, like just using it in place of a flour wrap for veggies and hummus. Since I’ve been totally craving falafel lately, yesterday I made baked falafel and wrapped it with cucumbers, tomatoes, sprouts and a tahini-lemon dressing. It was really, really good!! I think this is going to be tonight’s attempt… thank you, Whole Foods recipes …. Heat broth to a simmer in a large, high-sided skillet over medium-high heat. Add onion, garlic, ginger and jalapeño and cook until onion is tender and translucent, 5 to 6 minutes, stirring occasionally. Stir in curry and garam masala and cook 1 minute. Add tomatoes, garbanzos and 1 cup water and bring to a simmer. Reduce heat to medium and simmer 15 minutes. Stir in collards, cover and cook 10 minutes more, stirring occasionally, until greens are tender. 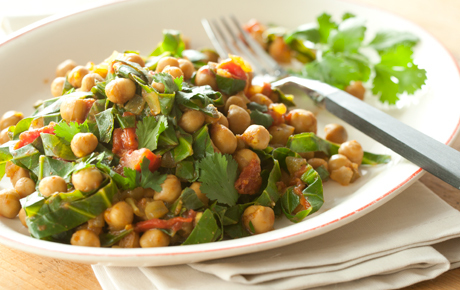 Stir in cilantro and lemon juice and serve. Sounds tasty and easy. I’ll let ya know!